The Girls on Fire campaign was started in 2015 to coincide with 16 Days of Activism for no Violence against Women and Children. 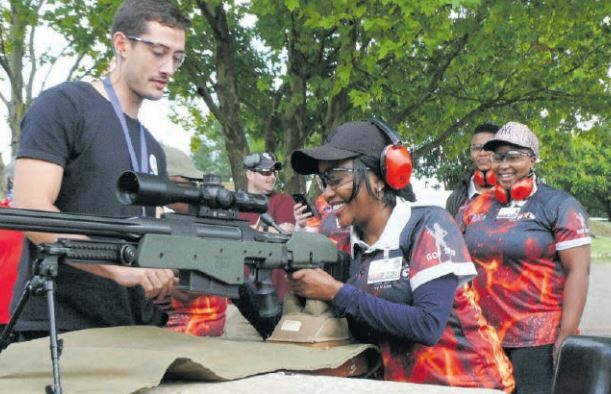 Nearly 100 women recently took part in the Girls on Fire top shot event at the Cecil Payne Shooting Range on the West Rand. The event was organised for women, by women. Of that number, 66% were novices and 34% were sport shooters, said match organiser Lynette Oxley. “Support each other, ladies. We’re here to have fun and give each other a hand,” she said at the pre-shoot safety briefing. Sanctioned by Gun Owners SA, women from all walks of life took part in 14 disciplines and codes which covered a wide range of firearms, from hand-held weapons to rifles. Star of the day was the monster Truvelo Armoury bolt action .50 calibre CMS rifle, almost as tall as some of the participants and which made the most noise per round. At R20 a round, it was probably also the most expensive to shoot, as well. Oxley said she had started the Girls on Fire campaign in 2015 to coincide with 16 Days of Activism for no Violence against Women and Children – November 25 to December 10 – and after an opinion piece came out in the media which claimed only old white men were shooting. “It’s not just them and I wanted to show firearms are not evil, it’s things all of us can enjoy,” she said, adding that if people wanted to carry a firearm, they had to be proficient in its use, know how to clear stoppages, and be safe at all times.